Interested in a Kia Optima Plug-In Hybrid? 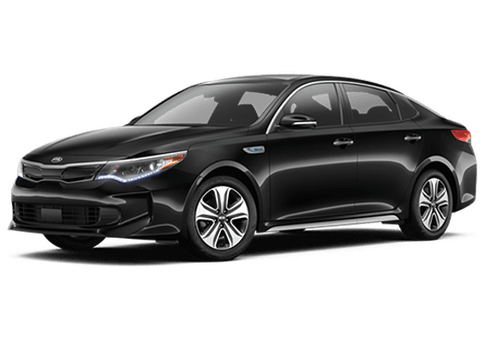 Because it offers a fully-electric driving option, the 2018 Kia Optima Plug-In Hybrid is a great way to reduce your carbon footprint, and preserve our planet. While it's not completely electric, the Optima Plug-In Hybrid has been named a Transitional Zero Emission Vehicle (TZEV) by the California Air Resource Board. You can even drive the Optima Plug-In Hybrid in the High Occupancy Vehicle lanes while you're driving by yourself. Thanks to its high-density lithium polymer battery, the Optima Plug-In Hybrid is capable of going fully-electric for up to 29 miles! The battery even recharges itself every time you press the brakes. Speaking of recharging, there are two different ways you can charge up your Optima Plug-In Hybrid. The 120V Level 1 charger uses the same outlets that your everyday appliances use, and is perfect for when you want to charge during the night. Just like your phone, plug in your Optima Plug-In Hybrid before you go to bed, and it'll be ready to go when you wake up. The 240V Level 2 charger is available for home installation, and is what you typically see at public charging stations. You'll be able to get a full charge in about three hours with this speedy and efficient charger. To help you save money while you charge, the Optima Plug-In Hybrid allows you to check your charging status, schedule charging times, and even lock and unlock the doors right from the palm of your hand. Compatible with both Apple CarPlay™ and Android Auto™, simply download the UVO eco App on your compatible smartphone to stay in complete control of how your vehicle is charging. This is a great way to make sure that you're not burning extra energy once the battery on your Optima Plug-In Hybrid is fully charged. You can also sync your phone to the Optima Plug-In Hybrid to bring all your favorite apps and music with you wherever the adventure leads you. Available on the 2018 Optima Plug-In Hybrid is a Lane Departure Warning System, or LDWS. This system is capable of using a sensor located behind the rear-view mirror to scan the road and detect your exact position by reading the lane markings. If you ever begin to unintentionally veer out of your lane, the Lane Departure Warning System will kick in and send you an alert to help keep you in your correct lane. How does it know when you're intentionally changing lanes? Simply use your turn signal and your Optima Plug-In Hybrid will know you're doing it on purpose.